The Hidden Blade is a compact and deadly device which has become a defining mark of the Assassin Brotherhood. It is a three part folding blade designed to quickly extend or retract as the user wishes. 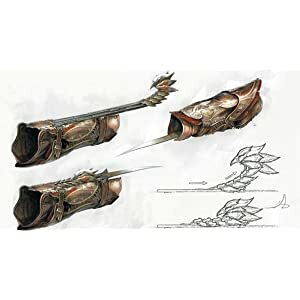 The blade is usually housed in a bracer and hidden on the underside of the forearm, stretching across the palm and reaching well past finger length when extended. While the blade is retracted it is nigh undetectable, until the precise moment that its owner puts it to use, making it a silent and deadly weapon. Possessing one is the mark of a true Assassin. The first recorded use of a Hidden Blade was during an assassination in 465 BCE. The weapon used was composed of a simple mechanism that was worn on the right arm, and extended the Hidden Blade from under the sleeve. This Hidden Blade changed the Order’s means of assassination, as Assassins had hitherto relied upon daggers, poison and even serpents to do their work. Throughout the centuries, the Hidden Blade has taken on several ritualistic aspects, with the very mechanism of the weapon refined to reflect the importance of its use, as well. 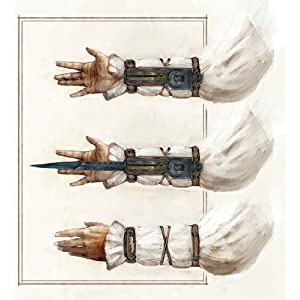 Now you can wield the Assassin's legendary Hidden Blade and Gauntlet; a must-have collectible accessory for fans of the Assassin's Creed franchise. This life-size replica of Jacob's signature weapon in Assassin's Creed Syndicate features a functional hidden blade. Display this as part of your collection or wear it to complete the ultimate Assassin look.